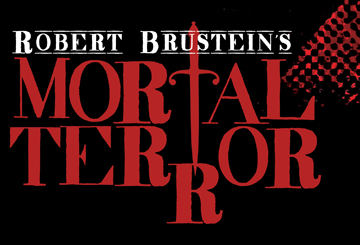 Suffolk and Boston Playwrights’ Collaborate To Present "Mortal Terror"
To Present Robert Brustein’s "Mortal Terror"
Suffolk University and Boston Playwrights’ Theatre will collaborate to present Robert Brustein’s "Mortal Terror." Directed by Daniela Varon, the production plays from September 15 - October 2 at the Modern Theatre at Suffolk University, 525 Washington Street in Boston. Playwright Robert Brustein brings the spirit of William Shakespeare back to the stage with an imaginative story of political upheaval set during the ignition of the Gunpowder Plot. In 1605, William Shakespeare, trapped by political intrigue, violence and betrayal, is persuaded by King James to create a play that justifies the new king's right to the English throne and his idiotic belief in witches. Torn between his commitment to his art and his need to placate the king, Shakespeare creates one of his greatest works -- "Macbeth" -- meanwhile contemplating an affair with the King's young dissatisfied wife. "Mortal Terror" is the second in a trilogy of plays about the life and work of Shakespeare by Brustein, Distinguished Scholar in Residence at Suffolk University. The first installment, "The English Channel," focusing on Shakespeare’s affair with the Dark Lady, Emilia Lanier, was produced at the Abingdon Theatre in 2009, where it was nominated for a Pulitzer Prize. The third part of the trilogy, "The Last Will," about Shakespeare’s return to Stratford Upon Avon towards the end of his life, will be produced by the Abingdon in New York in the Fall of 2012. The company of "Mortal Terror" includes Stafford Clark-Price as William Shakespeare, with Dafydd ap Rees, Michael Hammond, Jeremiah Kissel, John Kuntz, Georgia Lyman and Christopher James Webb. For information, call 866-811-4111 or visit www.bostonplaywrights.org.